This stylish and funky Cloud shape magnetic notice board adds a decorative flourish to your home, yet is also so very practical. The bold fun design is perfect for storing and displaying invitations, postcards, photos, shopping lists and other important memos. 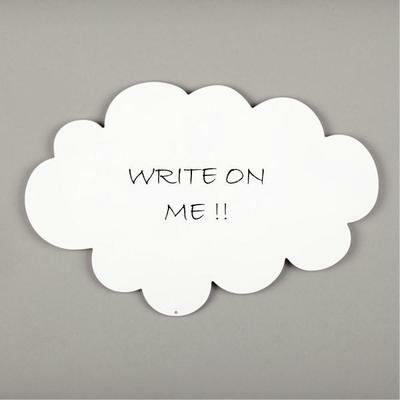 You can use a dry-wipe pen to write messages and notes directly onto the board. The Cloud is ideal for the kitchen, hallway, study, kids bedroom or anywhere you want to keep things at hand and on display. The Cloud weighs approx 1.0kg and is made in England to reduce 'design miles'. The Cloud Magnetic Memo Board measures approx H 55cm x W 30cm. Easy installation - Very strong Self-adhesive fixings supplied. Manufactured in Laser cut Steel and Powder Coated.